Head and shoulders oval framed portrait of John Muir (1838-1914). Muir was a naturalist, explorer, and writer. He was an influential conservationist who worked to preserve wilderness areas and wildlife from commercial exploitation and destruction. His efforts helped to establish Yosemite National Park and Sequoia National Park, both in California. 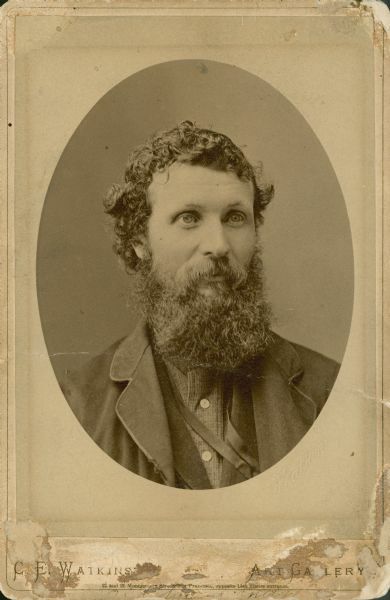 This image is part of the John Muir collection which includes correspondence of Muir to Emily Pelton and her mother regarding friends in Prairie du Chien, Wis., describing a botanical and geological survey along the Wisconsin River and into Iowa, and recounting a visit to Camp Randall in 1863.